Stable fracture of foot/ankle/lower leg, severe ankle sprain, post- operative immobilization. 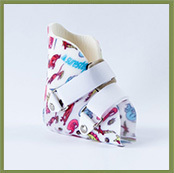 Ideal support and comfort for your smallest patients with mild to severe foot and ankle injuries. MiniTrax™ is the only pediatric walking boot to feature kid-friendly design elements that make wearing a boot less intimidating. Beneath the fun exterior though, the MiniTrax is a serious boot with big benefits. Low-profile rocker sole of the MiniTrax features a durable, non-slip tread tough enough to withstand the test of time - and of a kid! The SureStep system is available from Malcolm Freedman & Associates and is the most effective means of providing stability to children who pronate when standing and walking. This patented, dynamic system allows children to gain stability, while still allowing normal movement and function. Children with low muscle tone who have trouble with stability due to pronation can now walk, run and jump without the delays and instabilities that often result. SureStep is not a different brace, but rather a completely unique system that manages the foot and ankle with out over-managing. Ankle foot orthoses (AFOs) are orthotic devices with which we aim to either support, correct or immobilise an injured or misaligned ankle. They are also used to treat conditions affecting the function and form of the foot, such as a drop-foot or clubfoot. 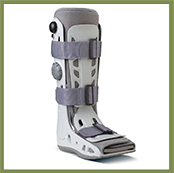 Corrective ankle bracing is only used in children and requires a custom brace to be made. With a custom AFO we try to keep the foot and ankle in a neutral position so that it can be corrected as the child grows. 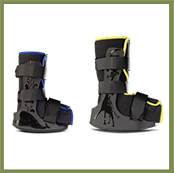 Common conditions requiring corrective AFOs include Spina Bifida and Cerebral Palsy, where the function of the brace is to correct the alignment and shape of the foot and ankle as the child grows. 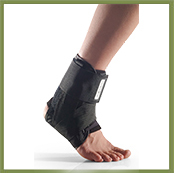 Supportive ankle bracing is mainly used to support an injured ankle while it heals, and to assist patients with chronic neuromuscular conditions. For neuromuscular conditions that result in a drop foot, a patient may need to permanently make use of an AFO to assist them with walking in an energy efficient and more comfortable manner. Some off the shelf ankle braces can also be worn for high intensity activities. These braces are usually less rigid and more compact in comparison to an AFO and their function is to either prevent an injury or to support the ankle after a previous injury. Some patients also prefer to use these braces as a step down from a cast or foam walker boot after surgery, as part of the recovery process.